For an elegant, leisurely get together, ditch that boring starter salad and serve your diners something new – an Asparagus and Prosciutto Salad with Frisee, Shallots and Mustard Dressing. The best salads never go out of style – they just change with the times – and there’s nothing wrong with being savvy with seasonal foods. This enticing asparagus and prosciutto salad with a luxurious mustard dressing is a better way to get everyone excited. If it’s presentation you’re going for, this prosciutto salad places the brightest ingredients at the center of the plate, and will inspire everyone to eat their vegetables. You can only win with this one! In a small ovenproof sauté pan over high heat, sauté shallots in 1 tablespoon olive oil until shallots begin to sizzle; sprinkle with salt. Cover with lid or foil and place in oven 10-15 minutes, until just tender. Remove from oven and cool. In a large saucepan, bring water to a simmer. Add one teaspoon white vinegar. One by one, crack an egg into the almost-boiling water and with a spoon, nudge the egg whites closer to the yolks. Turn off the heat and begin spooning water over the top of the egg until the egg whites are cooked. With a slotted spoon, lift eggs out of pan and into ice water. Set aside. In a medium sauté pan over high heat, add remaining olive oil and heat until shimmering. Add asparagus and cook 3-5 minutes, until lightly browned. Add roasted shallots to the asparagus and toss over heat for 30 seconds. Take the pan off the heat and add mustard seeds to the pan and toast 20-30 seconds. Add stock or water to prevent further browning; stir in lemon juice, mustard and red wine vinegar. 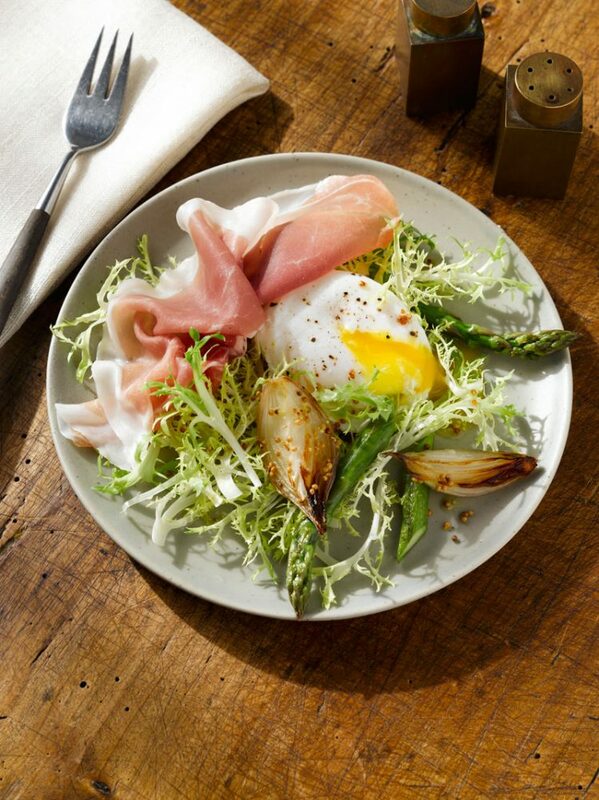 On a large plate, dress frisee with warm mustard vinaigrette and top with asparagus shallot mixture, slices of prosciutto, and poached eggs.